Find the buttons! Find the buttons! Bet ya can't find the buttons! Before diving into this, maybe give my introduction to “Monday Morning Designer” a quick read through… Right here. The advent of touch interfaces in the late 2000’s, led many companies to do anything they could to grab a piece of that buzzword pie. Samsung was no dummy. While they began a full-frontal move into the smartphone game, they also saw fit to apply a touch interface to a market they were already leading: the high-def television. This Samsung LN46A650 was released in 2008, right at the crux of the touch interface revolution (for lack of a better term). Samsung saw fit to apply this new popular interface to their televisions, as ‘near invisible’ buttons on the bezel. It was a novel idea, but a poorly executed one. As you can see in the pictures below, in a typically lit room, the buttons aren’t recognizable. It’s only when using a camera flash, that the buttons become visible. What is the use in a button that can’t be seen? Apologies for the poor camera phone image quality, but you get the point. 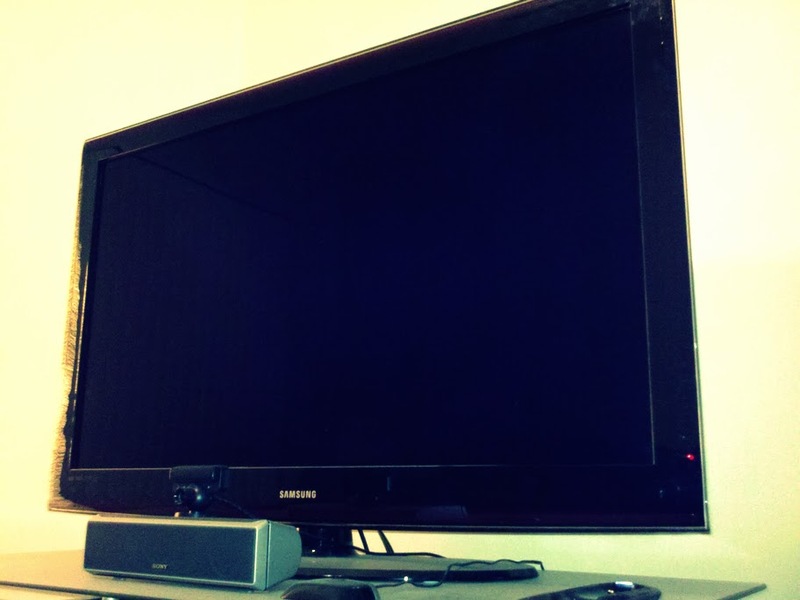 Most people use their televisions in less-than “operating room” brightness levels, and so any sort of buttons need to be visible in low light situations. This is why most AV remotes either glow, or have a button to activate a backlight to illuminate the buttons. As I mention remotes, you may be saying, “Well then who cares if you can’t find the buttons on the TV bezel, if you have a remote, with nice glowing buttons? !” My answer to that is two fold: 1 – Why waste manufacturing time and components in adding the buttons to the TV then, and 2 – What happens when you lose your remote, or run out of batteries… Buttons (for basic functions at least) are still a necessity on the actual TV. I will take a moment to note, that when the TV is off, there is a red indicator light that illuminates just about the “invisible” power button. This is a nice, useful touch; but only after you have actually figured out that the power button is just below this red light. Also, once the TV is powered on, the red light disappears; removing the only reference point to the invisible buttons. Sure, printing the button labels in stark white ink would probably have improved their visibility. But that would defeat Samsung’s purpose of applying “fancy-tech” invisible buttons. They have since corrected this issue, by moving the buttons to the side of the TV, behind the front bezel, as physical buttons again. They also have some newer sets that bring back the touch buttons, with strong contrasting labels, on colored backgrounds. I applaud them for correcting an unusable interface, but they pulled a 180 on the initial idea, and OVER-corrected. Let’s focus back on the original idea: invisible buttons. This is typically the way things go. An interesting new idea isn’t fully realized, is rushed to market, doesn’t work out, and a harsh new direction is put in place. This is most often a reactionary marketing decision. “That old interface was crap! Wait until you see the entirely new interface!” Poor reviews lead to overly-drastic solutions. And it’s true; we have to see the proverbial heads roll, before we’ll give a brand a second chance most of the time. Some people (myself included) like to give Apple a hard time for “feature creeping” their products. While aggravating to the early adopter crowd, you could say that Apple is being damn sure they fully realize these features, before releasing them to the public. On the opposite side, Google likes to use its users as glorified beta testers, and that’s not necessarily a bad thing either! It’s fun and exciting to play with cutting edge stuff, but at the same time, you have to be ready to deal with rough edges, and ever-changing products; and Google has to be ready to take reactions with a grain of salt. I would never condone tacking on a new technology to a product, just to be used as a buzzword in marketing. Nevertheless, Samsung did correctly see potential in capacitive “invisible” buttons as a usable TV interface… they just didn’t fully realize it. So, back to the original idea: invisible buttons. Where they went wrong, was in applying an old interface layout, with a new interface technique. They placed ‘power’, ‘source’, ‘channel’, and ‘volume’ in close proximity to each other, as if they were old, highly-visible, tactile buttons. What they needed to do, was simplify it, and lower the necessary accuracy. Why cram 6 buttons into a 4 inch space, when you have an entire bezel to use… Why not designate the area below the Samsung logo as the “power button”, the area above the logo as “input”, the area left of the logo as “channel”, and the area right of the logo as “volume”. Samsung (like all brands) was sure to print their logo in highly visible ink; it’s visible in low light, and becomes a perfect point of reference. Remember the red power light? Well this logo never goes away, and so, neither does your point of reference. If you can find the logo, you can activate the buttons. Red highlighted areas would only be visible in a user guide. Just one quick example of a way to use the “new hot technology”, in an interesting way, without killing usability for the sake of a marketing buzzword. Another idea was to use the left and right bezels as Channel and Volume, as it is more naturally understood to make “Channel Up” ABOVE “Channel Down”, but this seemed to spread the buttons out too much. Also, a lot of TVs are on swivels (like this one shown), and users will tend to grab those side bezels to turn it. Not a great idea to have buttons in prominent positions for another function. As a quick aside, Palm (now a part of HP) dabbled in this very idea with bezel gestures on the ‘Pre’ smartphones and ‘TouchPad’ tablets. Apple has also shown an interest in bezel interfaces with several recent patents, for use on future iPhones, iPods, and iPads. Companies should always be looking at new technological advancements and techniques (from all different industries) and playing with ways to use those technologies in their particular field. But unless a certain technology improves what they are already doing, they should not touch it.